The primary objective of the Club, as stated in our Constitution and By-Laws, is to encourage and promote educated involvement with pure-bred Golden Retrievers and to do everything possible to bring their natural abilities and qualities to perfection. To engage in any lawful act or activity related to, or in conjunction with, any of the aforementioned purposes. 1. General meetings are held at least six times a year. After the general meeting, programs are offered, as available, on topics of interest to owners, exhibitors, and/or breeders. Often the Club invites outside speakers with expertise in the areas of health, training, rescue, or other areas pertinent to the Golden Retriever. Members may bring their dogs to meetings. Dogs in attendance must be under control, clean, and exhibit no signs of communicable illness. Young pups especially find this a good socializing experience. 2. We showcase our Club's AKC Licensed Specialty Club status by hosting both a Designated Specialty and a yearly Independent Specialty Show and Obedience Trial, and Rally trial. Our Independent Specialty is an all-day dog show, drawing Golden exhibitors from far and near. We have built a sound reputation for "pulling majors," and we are known for our hospitality and exhibitor-friendly atmosphere. We are proud that usually 100% of the specialty trophies we offer are generously donated by our members. We owe our success to the volunteer spirit of our members who contribute their time and effort to the many large and small tasks that go into planning and hosting this event. independent full-service rescue and adoption program serving our area. In addition, the Club supports the fundraising efforts of the Golden Retriever Foundation, particularly its cancer research projects. 4. As an AKC licensed specialty club we offer a Canine Good Citizen Test once a year. The Canine Good Citizen Test, an AKC sanctioned program, is designed to teach responsible dog ownership to owners and certify dogs that have the training and behaviors needed to be reliable, well-behaved members of their families and communities. The Club relies on member volunteers to plan and organize these events. 5. In the summer, the Club holds a fun day/picnic for its members and dogs. With pot-luck dishes to pass and games for the dogs, the idea is to relax, visit with friends, and have a good time. also the usually uproarious gift exchange. 8. Special Events: The Club hosts an annual WC/WCX test (Working Certificate and Working Certificate Excellent) under the rules of our parent club, the GRCA. These field events promote and showcase the hunting ability of this breed. The Club will also continue to seek high-caliber public education presentations for our members and other Golden Retriever enthusiasts. The Club also sponsors and hosts an annual eye clinic open to all Golden Retrievers in our area so that owners may have their dogs’ eyes examined by a Board Certified Ophthalmologist. maintain a puppy referral system, coordinated by one of our members. Only members’ litters whose dam and sire have the current health clearances and other criteria required by our policy are permitted to be listed with this service. 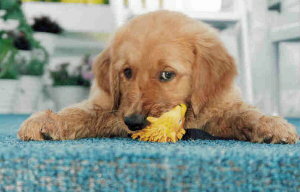 See our Puppy Referral guidelines for more details. 10. The newsletter and website: The Club publishes a newsletter for our members, The Golden Times, which is the source of current information on the Club's activities. Our website contains facts about our club, updates on current events and issues, and links to even more information regarding Golden Retrievers.